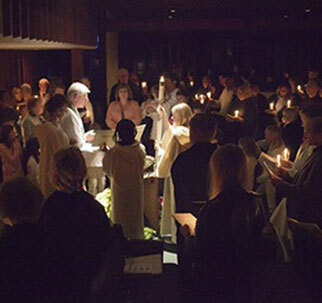 Members of Cross of Christ Lutheran Church, Bellevue, Wash, gather at the font at an Easter Vigil. The story of the Last Supper in John’s Gospel records a remarkable event that is not mentioned in the other Gospels — to illustrate humility, Jesus performs the duty of a slave, washing the feet of his disciples and urging them to do the same for one another. Some Lutheran congregations incorporate this act of humility into their Maundy Thursday services. No vestments or paraments are used on this day. The stations of the cross is a devotional practice that consists of 14 stations, each one standing for an event that occurred in the passion of Jesus. Art, combined with literature, movement, prayer and reflection assist people as they work their way through this devotion. These are the phrases spoken by Christ during the time of his crucifixion. Recorded in the Gospels, they reveal the divinity of Jesus as well as his humanity. Italian for “three hours,” “tre ore” refers to the time that Christ was on the cross — from 12:00 noon to 3:00 p.m. While no definite ritual is prescribed, this service centers on a series of homilies on the seven last words of Christ, along with appropriate hymns, periods for silent meditation, and the stations of the cross. Tenebrae is usually held the evening of Good Friday and includes the gradual dimming of the lights and extinguishing of candles. The Christ candle is removed from the sanctuary and a concluding “Strepitus” or loud noise (slamming shut the Bible) symbolizes the earthquake and agony of creation at the death of Christ. White is the liturgical color used on this night. The Easter Vigil is the pinnacle of the church year. Held between sunset on Holy Saturday and sunrise on Easter morning, it is the first celebration of Easter (traditionally holy days are considered to begin at sunset). The Easter Vigil begins outside of the church building where a new paschal candle is blessed. Worshipers are reminded of the connection between the Passover of ancient Israel and the new Passover, which is Christ’s victory over sin and death. The alleluia is used for the first time since the beginning of Lent. During a service of new beginnings, new brothers and sisters in Christ are baptized and new members are received through confirmation or the profession of faith. In “Evangelical Lutheran Worship” there are 12 Old Testament readings that are appointed for this service, which recount the acts of salvation throughout history. Some of the readings may be omitted leaving four that should not be excluded — the story of creation, the deliverance at the Red Sea, salvation freely offered from Isaiah and Daniel’s deliverance from the fiery furnace.